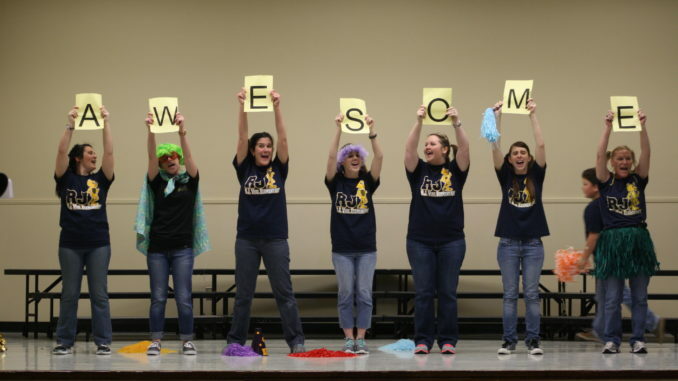 Prior to administering this year’s LEAP and iLEAP tests, R.J. Vial Elementary School in Paradis held a testing pep rally to get students excited. Several students and teachers put on skits to inspire and encourage those preparing to take the statewide tests. LEAP test outcomes for the 4th and 8th grades determine whether a student can go on to the next level. iLEAP scores given to grades 3, 5, 6 and 7 have no bearing on whether a student advances to the next grade, but provide an idea of what a student and school’s performance is for the year. Last year, based largely on student performance on the tests as well as other factors, R.J. Vial Elementary was elevated from a ‘B’ to an ‘A’ rated school. This year marks that last time students in Louisiana will take LEAP and iLEAP tests. The tests will be phased out next year and get replaced by nationwide standardized tests.